Do I really have to explain why this one is here? A common thing I've said about a lot of comics on my list this year was that, at the time, I couldn't believe I could finally see the issue in person, let alone own it. While I love thinking back to a time when Giant Size X-Men #1, Magnus Robot Fighter #1, or Showcase #22 gave me that rush of heady incredulousness, the feeling has since passed. You grow accustomed to the book. You still adore it, but you accept that it's yours. Batman #9 has never gotten to that point for me. Every time I even think about this book, I still can't accept the fact that it's mine, even though it's been mine for nearly ten years now. It's really the only book I own which matters to me neither for the stories within, for a historical first appearance or other big moment, nor for the memory attached to it. It's simply Batman #9. I still can't deal with that. 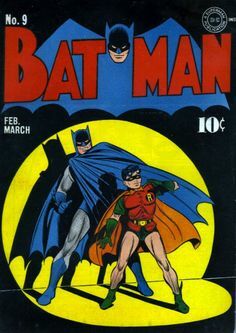 It's one of the greatest Batman covers ever made, and it's my second oldest comic book, but most of all, it's frickin' Batman #9. I clearly remember my naivete back then, having recently signed up for Mile High Comics (how little I knew then!)' mailing list and seeing there was a 40% discount on all back issues. WOW! Again, how little I knew back then, but I was also ignorant enough at the time to believe that it was worth searching extensively through the entire database of rare comics I could only dream of owning, just to see if some amazing issue was there, and if it really was selling for 40% off. Somehow, someway, for perhaps the first and last time in history, there was actually a good deal to be found on Chuck's website. Batman #9, rated in 3.0 condition, selling for $750, which, with the 40% discount, knocked it down to only $300. Now, though I'd grown accustomed to saving up for shows and spending large amounts of cash on key books there by this point, I certainly didn't regularly spend large sums of money on impulsive last minute purchases, but screw it all. I charged the $300 to my credit card, told my wife after, and promised to ebay a bunch of stuff to make up for it (which I did). I still don't understand HOW I got that deal. The book was worth at least $600 then and sells for $800-$1,200 in that condition today. It's also worth noting that my buddy Doug (the one I mentioned earlier on this list) and I both plateaued in our collecting around this point. He obtained an Amazing Fantasy #15 and just couldn't find another book to be excited about after that. Nothing was ever going to top that acquisition. I got Batman #9. Oh, I eventually tracked down a #8 and #10 to go with it for almost as little money, but it just wasn't the same. Batman #9 was my watershed. I pretty much stopped chasing pricey key issues after that point; there was no more thrill to be found after that greatest of victories. I'm a regular run filler today and, with a few small exceptions (Last Spring, I got an Avengers #8 -- 1st Kang), that's all I really need. Batman #9 will always be my high point. This issue had maybe the best slugfest I ever read in a comic book. Thor determined to go to earth to be with Jane Foster ,fights his way out of Asgard against Odins will. We all know he will have to answer for that. When he arrives, he see’s Jane with Hercules and flies into a fit of jealousy. I’ve read a lot of fights over the years but fighting because someone’s with your girl ? I loved it. 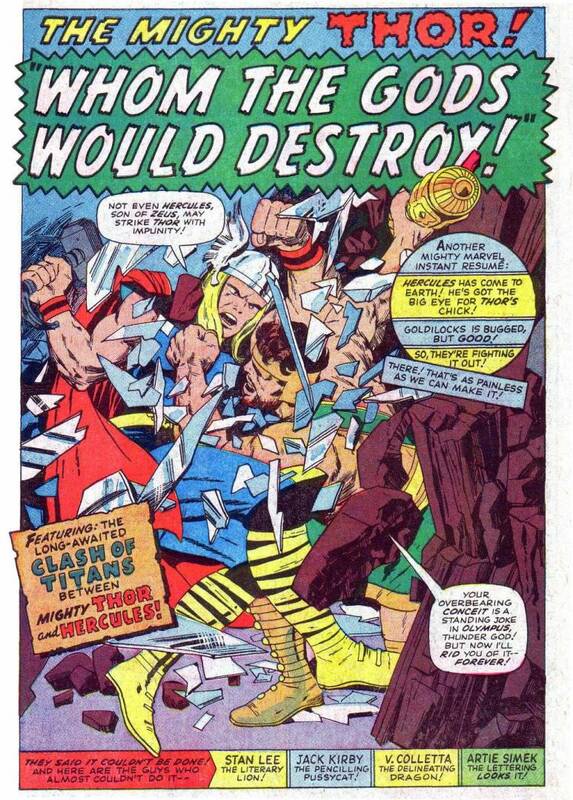 The layout of this battle Royal was done as only Jack( King) Kirby could do it. Changing scenes, thunderous blows, property destruction, It’s all there. And I’m a sucker for all the smack talk and braggadocio between the two. The melee ends when Odin takes half of Thor’s strength as punishment and makes him an easy target for the big mouthed Olympian. 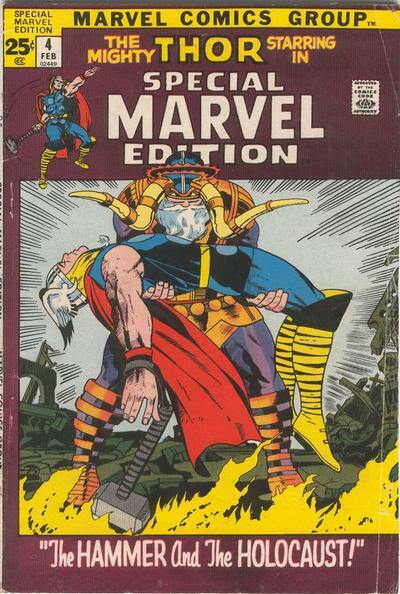 What a great fight and every time I read it , I get a disappointing feeling knowing that Thor will be robbed at the end. 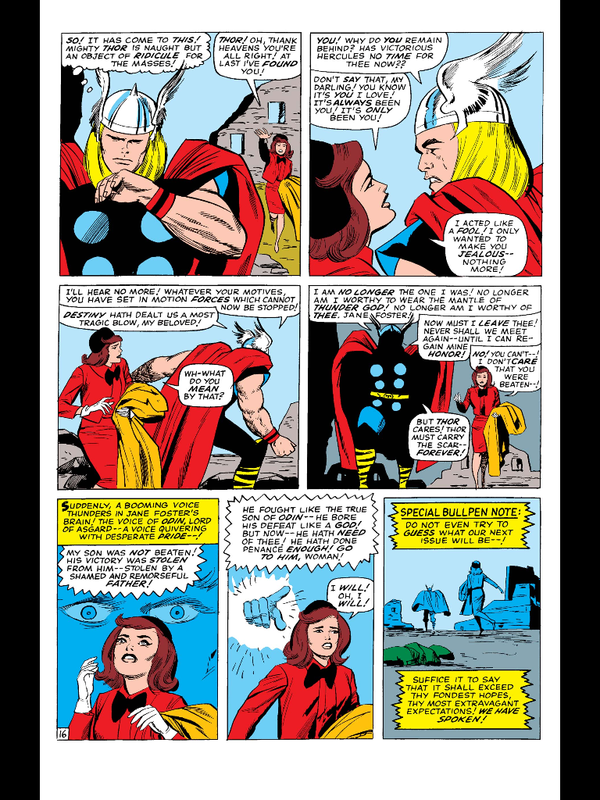 In a nice touch, Odin, feeling remorse that his son was beaten, talks to Jane and implores her to go to him. I knew I had read a great battle but Who knew I would be reading a love story as well ? Great Book . Nuff said. I LOVE the trash talk! This is just a great page and gets me every time. Seeing as I know nothing about DC books for the most part, I would definitely benefit from an explanation. I’ll be the first to admit that there is nothing great here. Then why so high on my list? Only a year or so into comics, good was good enough. Particular when you come across something that represents everything that’s good about comics. Entertaining story. Quality artwork. Love of character history. It read like a love letter to Legion fans. But I read it as a love letter to comic fans. Even the side bits in the back, recapping the origins of the individual Legionaries and explaining their 30th Century equipment and technology, did not feel like filler. Just the opposite, it felt festive. It was a celebration. A comic that embodies the zeitgeist of an emerging Space Age and Silver Age. The roster of talent is, well, stellar: Broome, Fox, Infantino, Frazetta, Finlay, Toth. Both the future and the past never looked so good. I don't remember seeing very many Charlton books on spinners over the years. Given their notoriously spotty distribution, that's probably not surprising. I do know where I bought this book. It was at a Circle-K that was about a mile or so from my Grandparents house. Probably a little less if you cut across the apple orchard, which I usually did. I suspect it was the cover that got me to buy the book, notwithstanding the fact that the holster is wrong. This book was a Don Newton tour-de-force. He did everything from the cover to the back. Okay...he probably didn't color it. But writing, art and lettering. And that was it. Don Newton was my favorite artist from then on. And he was the first artist that I followed. The first New Mutants series was a godsend for an unpopular misfit teenager in the mid-80s. The X-Men were my favorites at that point, but I didn't yet have the life experience to fully appreciate every issue they dealt with. Then came this book; I suddenly felt like I had friends who "understood" me better than the one or two real life ones I had. For this reason I will always love Chris Claremont. This issue also features the arrival on Earth of the alien Warlock, a character only Bill S. could hope to draw, but even though his story takes up a large chunk of the issue, it isn't what I mostly remember it for. For me, it's all about the human interactions. Wow, this is actually the first Marvel book on my list. X-Men fans are generally a divided group of fans. You have those who believe that the book died when Byrne and Claremont split. 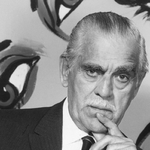 Others feel that Morrison was the pinnacle of the franchise's brilliance. There are even those who view the only real "X-Men" as the original Lee/Kirby X-Men. Personally, I find myself in a rather small camp: the late 80's Outback X-Men era. Most fans generally loathe this era and view it as the point when Claremont had jumped the shark, but it holds a special charm for me. This was the "darkening" of the X-Men done right. They were broken and scattered, yet never lost their sense of family and hope for the future. The original X-Factor series was so enjoyable for me because it saw the O5 X-Men back together as a full team for the first time in a long time. It was like watching the band getting back together and all these old friends reunite after so long. Bob Layton, who kicked off the series, is often under appreciated in my opinion. In this first issue, he nails the banter between the characters and really portrays Cyclops as deeply complex character. Louise Simonson would soon take the series in her own direction, but the foundation Layton set in this issue helped created one of my all time favorite X-Men series, cementing this period is my favorite X-era. 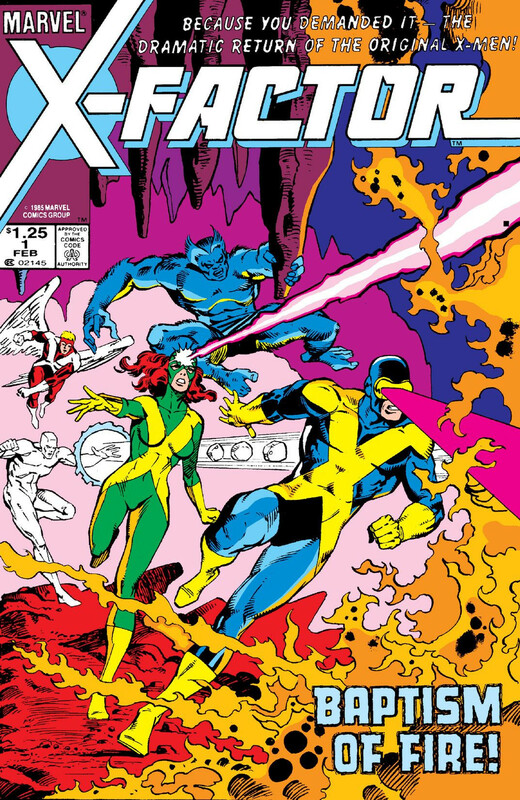 I began reading X-Men in 1991 with X-Men #1. I got all the variant covers. X-Men #1-3 marks Claremont's final story, and one I still hold fondly. I thought it served as a great beginning and introduction to X-Men and would later recognize it as a great ending to Claremont's epic run. I read X-Men regularly from then on, but it was never any good. I also collected backwards, and that was great. I bought the X-Men Omnibus collecting Giant-Sized X-Men #1 through X-Men #119 and filled in #120 on in issues. Reading through the whole saga beginning to end is just great. I love when the team decides they are failures and may as well break up in #251, when Wolverine stabs Rachel in #207, and Storm's entire journey from #150 until 229 or so. There are great side stories, in particular Fantastic Four vs. X-Men and Kitty Pryde and Wolverine. And, of course, this graphic novel. Which sees mutants the targets of bigotry spurred on by religious zealots. Some moody art by Anderson, strong characterization of Magneto, iconic panels, and a great speech from Kitty all add up to what I think of as the definitive X-Men story. 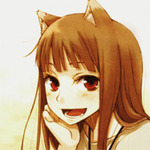 That said, I agree Cei-U! 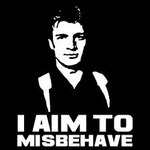 has violated his own rules and should be banned from further participation. Synopsis: In “The Song of Orpheus,” we learn how Dream came to have a son, and how Orpheus was able to visit the Underworld. Why I chose it: In Retrospect, I had probably been edging towards The Sandman for some time. I had read and thoroughly enjoyed Books of Magic (even if it had been a bit weird in spots), and I had heard good buzz about the series, but had never picked it up. But 1991 was a year of changes for me, I had finished university, moved interstate and started my first full-time job. And while haunting the second-hand bookshop near work, I found this in the store's collection of second-hand comics. 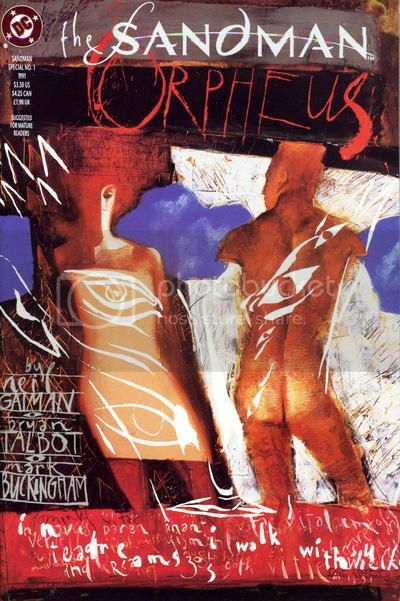 Given this was a self-contained story, I figured I could check out Sandman to see if it appealed to me. I don't remember what I paid for this issue, but it can't have been more that $1 or $2. And as soon as I read it I was hooked. That I could get so involved in a story that I already knew the end of (the tale of Orpheus) is the mark of an amazing storyteller. And this story gives you great vignettes of the personalities of all of the Endless. I started collecting The Sandman (and the most cash I have ever laid out for a single comic was for a The Sandman #1 to complete my run). So this issue is important to me for several reasons. It was my introduction to Sandman. It was the first story I where ever truly believed that comics could be great literature. It is my best ever find in a second-hand store. And it is now one of my few autographed comics (I got Neil Gaiman to sign during a tour of Australia a decade or so back). And it has a 'glow-in-the-dark' cover! One of the types of story 2000AD did so well was the Future Sport. 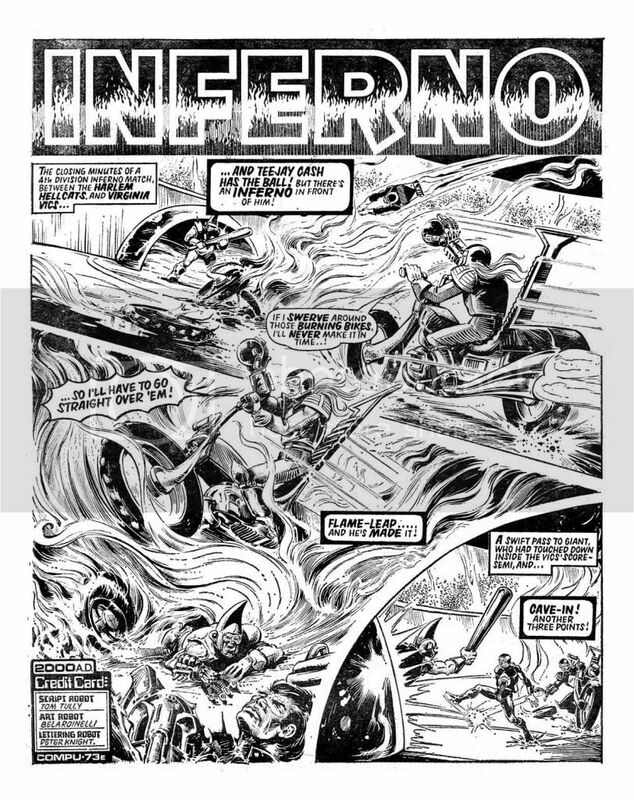 Here it is in the form of Inferno drawn beautifully by Massimo Belardinelli, the story is a sequel to the earlier Harlems Heroes which at times was by Dave Gibbons. 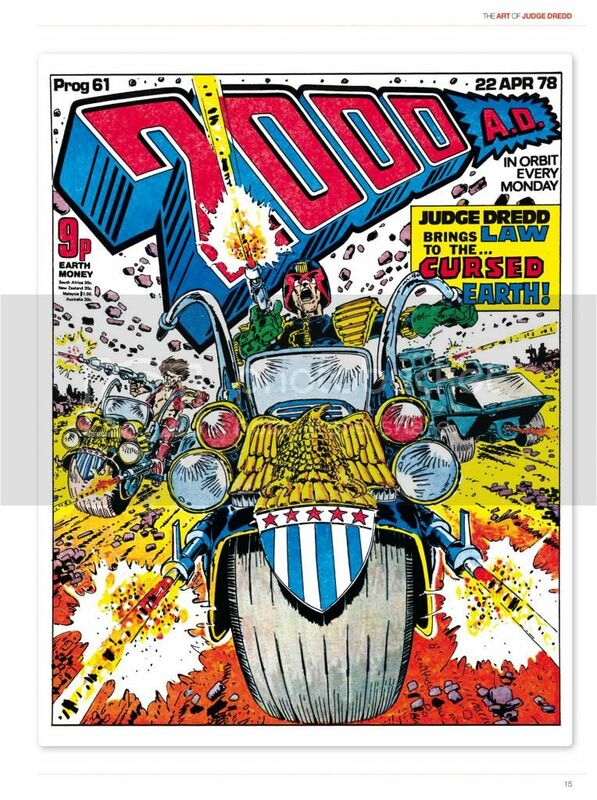 As I have mentioned elsewhere I had been a fan since the first issue, but it wasnt until here, with the first chapter of Judge Dredd's Cursed Earth saga that I believe 2000AD came of age. Slowly over the next few years we got bigger, better, incredibler stories by a rogues gallery of the best Britain would ever have. 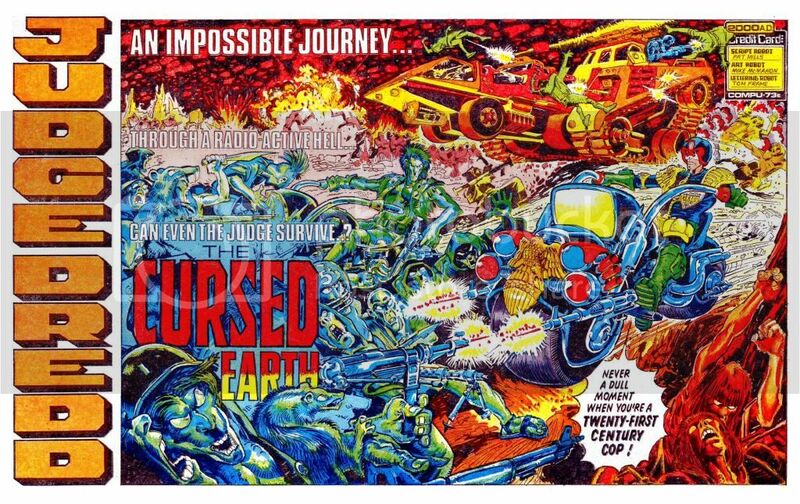 Cursed Earth cemented Brian Bolland as one of the most creative talents, and certainly one THE best cover artists on either side of the Atlantic, and within a few years the likes of Alan Moore and Alan Davis were establishing the starts of very successful careers. 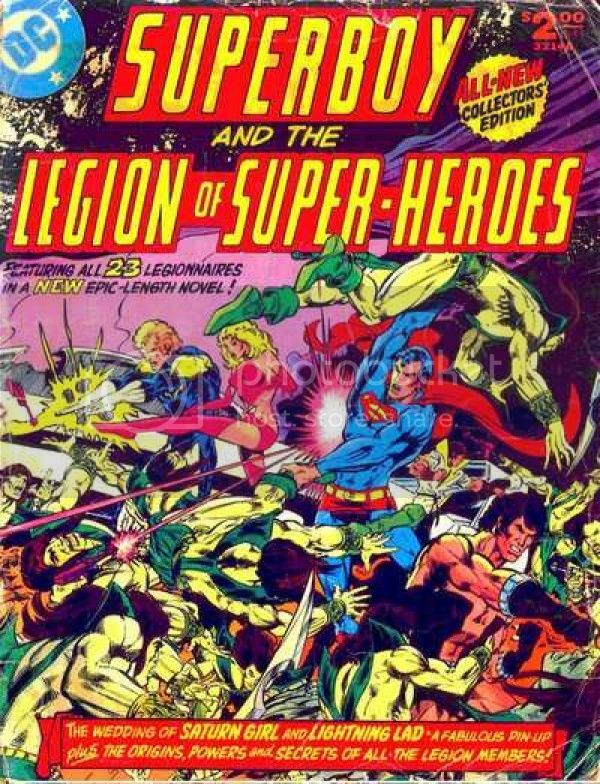 Day 10 was originally going to be my Day 12 pick, as it's the first comic I ever bought off a spinner rack (actually my mom did, this once, and never again). All my other comic purchases, daydreams, schemes and desires flow from this single issue. First of all, notice at the top it references the Super Friends, which I loved. We also see Superman, Batman, Wonder Woman, and green K that I knew from the cartoon. That all caught me eye, but it's the curiosity factor that really pounding me even more : fire creature, last angry god(! ), and all these of characters I didn't even know the names of. 100 pages of greatness, though the lead story is weak, but had the characters switching powers to overcome the villain IIRC. There was a word find which I didn't hesitate to immediately play. "Evil Star Over Hollywood" was a reprint from All-Star Comics # 44 written by John Broome (to this day a favorite writer), with art and cover by Irwin Hasen, Arthur Peddy, and inks by Bernard Sachs and Bob Oksner. Can't help but still have a soft spot for this story. Cool as the JLA were, I really fell hard for the JSA. Next is "Creatures of Nightmare Island" reprinted from Justice League of America # 40 by Gardner Fox and Mike Sekowsky. A pretty decent story, but the one thing I remember blowing my mind was how it referenced great people / spiritual leaders like Jesus Christ, Buddha, Confucius, Mohammed and others. Wow ! and I was only 8 years old ! If I end up getting buried, this is the issue that goes with me.